A natural remedy and preventative for colds and flu. Fire Cider has a long history as a folk remedy for illness. A potent cocktail of hot aromatic herbs, this elixir works as an anti-inflammatory, anti-bacterial, and natural antibiotic with immune regulating benefits. Add 1/2 white or yellow onion chopped, 1/4 cup horseradish peeled and chopped, 1/4 cup ginger peeled and chopped, 1/4 cup garlic peeled and chopped, 3 large jalapenos sliced, 2 lemons zested and juiced to a 1-quart mason jar. Cover chopped ingredients with organic apple cider vinegar and seal jar. Let steep for 4-8 weeks in a dark cabinet. The longer the better. Drain veggies, add honey to liquid mixture to taste. Veggies can be used for stir-fry. Take fire cider like a shot or mix 1-3 TB with tea or juice. Use daily as a preventative, or 3-4x day for treatment of colds/flus. Apply to a cloth and place on chest for congestion. Add extra honey to use as a cough syrup. As far as immune tonics go, fire cider contains all the heavy hitters. I love it as a refreshing wake-me-up in the morning or after a long day of work. It is spicy and will clear out your sinuses and give you a jolt of energy. 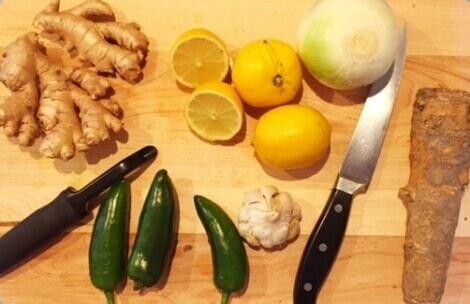 Want to try another at-home traditional healing food? Check out this Congee Recipe. Are you in the Boulder Area? Acupuncture treats colds and flus.